Lovely card Sylvie, love the flowers. Gorgeous card - creative, original and very artsy. I love it! A great card Sylvie .. .. I have never owned a Stickeroo in my life. Not sure I would be able to use them .. .. I would want to keep them in my stash!! LOL!!! Love the flower embellishments you have added and that lovely butterfly. Beautiful, fabulous details, I think I may need to invest in some stickeroos. 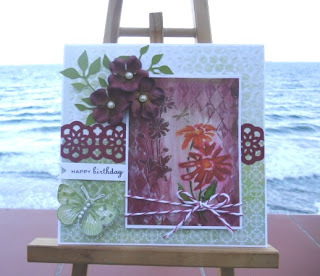 Thank you for case-ing my card for Penny Black Saturday Challenge. Wow this is so beautiful Sylvie all those wonderful flowers both in the image and the ones used for embellishing, the colours and design look perfect.